Clarett 2Pre USB | Focusrite Audio Engineering Ltd.
Great product in comparison with competitors products. Buying refurbished and getting a very nice product delivered in original packaging is a big plus. Highly recommend. Great product, can't wait todo startup using ir. Great ! Works like it's supposed to. Great product! No latency at all! Clean sound. Load of possibilities to play guitar without bothering my neighbours. Great sounding interface with many routing options. It has very low latency and I was surprised by the quality of the preamps when plugging in a microphone with the air function. Sturdy build quality and also looks great. Would definitely recommend this as a studio upgrade. Very clean sound. One of the best Audio interfaces out there regardless of price. Excellent. Powerful, full of features, easy to use. Thank you! Lovely bit of gear plenty of ins and outs and noise free! Great build quality too! *THE* Perfect USB Audio Interface!! I have no complaints about the Clarett. It is a fine unit that does everything I need it to do. The recordings all sound great without any strange colouration from the pres, everything is flawless. So much so that we just bought a second unit for our B rig. Just wow. 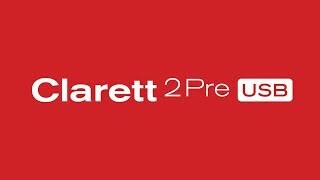 I first had my mind on the Scarlett 2i2, but after hours of research and comparison on Focusrite, YouTube, and other websites, I realized that using more money and getting the Clarett 2Pre would be worth more for collaborations and music projects. Everything that comes with it is just as I wished and I could not have bought a better interface for that wonderful price. Thank you for everything! Pretty portable. Amazing sound. Amazing quality. Very easy to use. I recommend it to anyone not looking for more than 10 channels (2 pres 8 adat). The interface is really sturdy, stable and good preamps! This product is awesome! I just falling in love with this. Good gear. Clarett is best audio interface! Fast and reliable drivers with excellent sound reproduction. Can't comment on its recording capabilities as I only used its audio outs. The sound quality is worth the price! Excellent DA, good mic preamps with very low noise, sturdy build. Received my order today . Main purpose to use it with the ipad. Took only 10 minutes to set everything ready and go. Very handsome looking product with very clear voice recording. Love it. Awesome interface at this price point it's amazing.The feel of the knobs is a bit light and flimsy,but other than that, it's built like a tank. Clarett USB lays down the challenge to interfaces twice the price. The Clarett USB range features specially designed high performance, low-noise (-128dB EIN) mic pres with a low distortion, ultra-linear design that guarantees a clean, open and transparent sound, giving accurate representation of the original performance. Boasting 119dB dynamic range, Clarett can now be experienced with any Mac® or PC supporting USB 2.0 and above. Decades of analogue circuit design experience, applied around 24-bit/192kHz A-D and D-A conversion, delivers a superior signal path. The two Air-enabled mic preamps can reproduce the input impedance, clarity and frequency response curve of Focusrite's original ISA mic preamp. Clarett 2Pre USB connects to Mac® or PC using the included standard USB and USB Type-C™ cables. Record with super-low latency through amp simulators and effects plug-ins.